As the kind bus driver quickly corrected me, it's St Tropez (pronounced San Tropay) not San Tropezzzz. I couldn't pass up the chance to see this famous little French town since it was only a couple-hour bus ride from where I was staying. It may not have the name recognition of Cannes, Nice and Monte Carlo, but it was glitzy in its own right. The bus ride along the coast was beautiful, albeit slow. We passed through many quaint beachy villages, in any of which I would be happy to plunk myself down for an extended stay. It looks how you think it should look - rocky yet green mountains plunging into painfully inviting blue/turquoise warm water with little bars and cafés along the beach. I just can't believe people live there. My first view of St Tropez was not actually of the town itself, but of the enormous - and I mean enormous - luxury yachts and sailboats crowding the gulf. "Oh so it's this kind of place" I said to myself. After debarking I headed into the center to have a look around, find some food and see what the hubub was all about. There are dozens of fine boulangeries in which you can get a reasonably priced sandwich. Although in the rest of France a sandwich will cost between 2-4 euro, here they're around 5-6 euro. I was annoyed until I bit into my hearty fresh-baked baguette filled with amazing brie and fresh salad. Not so bad I guess. Usually you can find a "formule" as well - something that will include the price of a cold drink. That's the deal. The town is very beautiful. Brightly colored pastel buildings with bouganvilla and wisteria cascading down their sides; along with pristine brick and cobble stone streets make for a nice setting. Again - people live here?! I was surprised but not really surprised, to see the architectural similarity between these buildings and those of Gorée Island and St. Louis in Senegal. Those two places were central to French colonialism in Africa, so it makes sense that the buildings would look the same. St Tropez is verifiably a playground, with endless opportunities for water sports, beach time, and exploring the little coves and towns. One can totally get by on a slim budget by buying picnic food at the grocery store and spending time walking the town and nearby beaches. Of course if you want to shop that's a different thing. I saw no less than 3 ferraris, and thought it would be appropriate to enjoy 1 of my 2 purchases, a 2.5euro coffee, whilst sitting near the port between the Hermes shop and another aptly called "Billionaire." I felt rich with gratitude. Because I've been making my way to meet up with Jon in Rome, and we've been doing some serious penny saving, I unfortunately only planned 1 overnight in what I now realize is the incredible city of Nice. 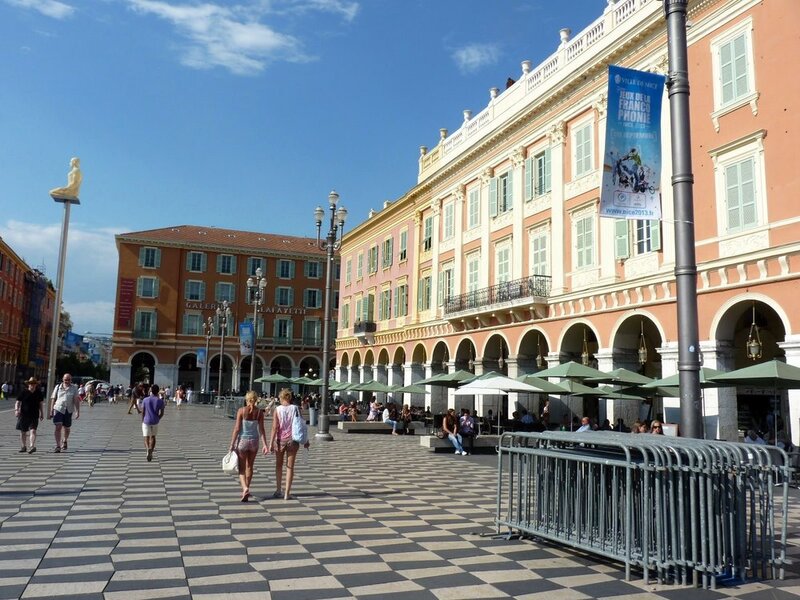 I thought it would be kitchy for some reason, but the few hours I spent there told me that, in addition to also being luxurious, glamorous and chic, Nice is steeped in art and culture, great food and excellent nightlife. Yes, I discerned all that between my 3pm arrival and 7am departure. Truly though, it has a strong place in art history, being a home of Picasso, Matisse and Chagall. The architecture is beautiful, and although I didn't have time to see it, there's an incredible chateau that is also a fountain on top of the hill above town. Wow! A chatountain! Because my time was so pathetically short, I completely gave up on sightseeing and opted for beach and book time. Nice is one place that, while you can do it on a budget (hostels range from $20-$40/person/night), I wouldn't mind having a little something to play with to take part in the café culture and fine dining that is there. Plus the museums and opportunities to play on the water require a bit more funds. Next time! Although it's a rocky/pebble beach, the blue waters of the city beach are still great for sunbathing and swimming; but I'm guessing are even better for summertime beach parties. It's what life's about on the Cote d'Azur. Now that I'm using BlaBla Car (carpooling), I've been able to travel overland more easily. Driving from Nice along the Riviera and down the Italian coast was something I didn't want to miss. And that coast is beautiful. There's a reason the rich and famous use it as their playground. The scenery, with lush green mountains, silvery rocky tops and plunging coastlines where tiny beaches and hillside villages linger, is truly a sight. Although the land didn't change with a simple border crossing, the Italian side presented a slightly different architecture and towns that seem to tumble off the hills into the sea. That plus the knowledge that it's full of Italian goodness made me incredibly excited to be in Italy for the first time. I'm looking forward to reconnecting with Jon and sharing more with you about Italy!